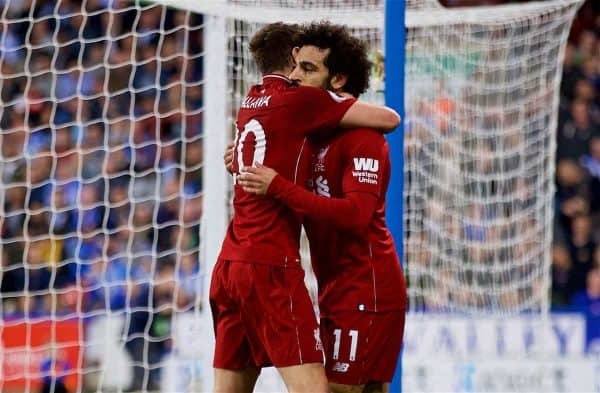 Liverpool edged past Huddersfield with a scrappy performance and 1-0 victory, thanks to Mohamed Salah‘s first-half goal. Liverpool returned to action after the international break as they took on Huddersfield, searching for a first win in five. Jurgen Klopp opted to make a few changes from his usual starting lineup, with Daniel Sturridge and Adam Lallana making their first league starts of the season and Xherdan Shaqiri also coming in. 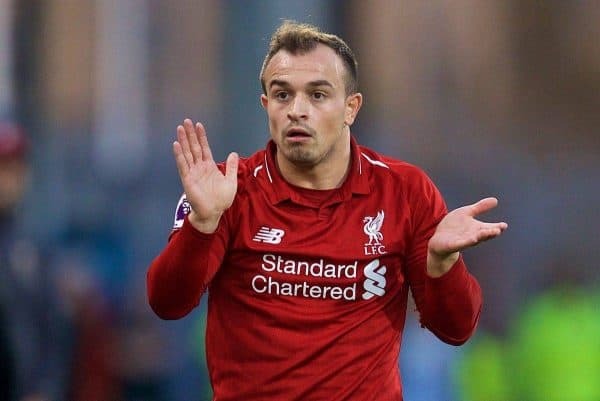 A systemic shift was also evident: Shaqiri played central in a 4-2-3-1, with Lallana left and a midfield double-pivot consisting of James Milner and Jordan Henderson. As the first of a much kinder run of games, Klopp would have been not just hopeful of a win against the relegation-threatened hosts, but demanding of one. It wasn’t the prettiest display by a long distance, but the Reds did enough to get over the line. The Reds dominated much of the early possession, as was to be expected. Chances didn’t come easily in the first 20 minutes though; despite some nice buildup play at times, it was evident more than once that a few of the forward line hadn’t played much together of late. Sturridge and Mohamed Salah almost linked to good effect a couple of times and at the other end Alisson was closed down as he kicked clear a backpass, but neither side really threatened. Halfway through the first period, however, that all changed. Joe Gomez fed a crisp pass infield to Shaqiri, he played in Salah and the Egyptian forward buried a first-time, right-footed finish into the far bottom corner. Jonathan Hogg smashed a long-range shot against the post on the half-hour mark, with Alisson beaten, but the home team were leaving themselves open more often to the Reds’ counter-attacking potential. Even so, the threat was there from the Terriers and Philip Billing smashed a 25-yard free-kick a yard wide of Alisson‘s goal just before the break. Huddersfield indeed finished the stronger as Klopp cut a frustrated figure on the touchline, appealing for a penalty and then having a strike disallowed for offside in the final seconds of the first half. 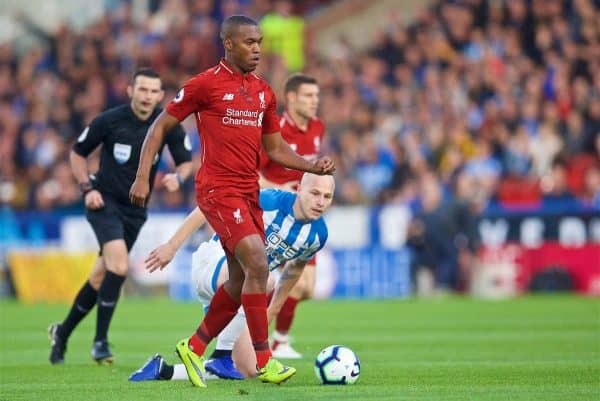 Klopp made a switch at half-time, bringing on Gini Wijnaldum for captain Henderson, with a tight hamstring cited as the reason, but the Reds remained sloppy in possession and invited pressure as they ceded the ball too easily. Laurent Depoitre easily beat Dejan Lovren in the air to head at goal, forcing Alisson into a save in the second half’s first real effort on goal. That seemed to wake Liverpool up a little and they threatened off a couple of corners thereafter, before Sturridge freed Salah in behind—but his scuffed shot flew wide. A clearly struggling Lallana was replaced by Fabinho for the final 20 minutes or so, with the Brazilian finally making his Premier League bow. Huddersfield had a great chance to equalise with seven minutes left as both centre-backs missed a cross, but Steve Mounie shanked his shot over the bar. Heading the other way, the Reds immediately had a three-on-one chance—but Roberto Firmino chose the wrong pass. Moments later, the Brazilian fired a great chance over the bar. The Reds saw out the win despite being nowhere near their best and moved back to joint-top, behind Man City on goal difference. Huddersfield Town: Lossl; Zanka, Schindler, Lowe; Hadergjonaj (Mbenza 69′), Mooy, Hogg (Diakhaby 90′), Billing (Mounie 69′), Durm; Pritchard; Depoitre. Subs not used: Hamer, Van La Parra, Bacuna, Stankovic. Liverpool: Alisson; Gomez, Lovren, Van Dijk, Robertson; Henderson (Wijnaldum 45′), Milner (Firmino 76′); Salah, Shaqiri, Lallana (Fabinho 69′); Sturridge. Subs not used: Mignolet, Matip, Alexander-Arnold, Origi.